This website is a labor of love created by Kate Duva (fka O'Rourke), Intergenerational Community Educator. It will continue to grow with the collaboration and partnership of many other prosocial people - one of whom could be you. Parents, Caregivers, Teachers: THE POWER IS OURS! from Kate Duva on Vimeo. If you care for or teach other people, you do the work that makes all other work possible. You keep the economy running. And you are one of the biggest forces for peace in this world. Or want to do some interviews, poetry or performances of your own? We can create together, in person - stay tuned for events coming up in Chicago in 2017! But we can also connect online, and share our creations via social media, videos, articles & more. 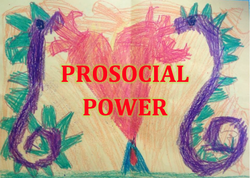 ​Write kate@prosocialpower.org or sign up for the mailing list below to join the dialogue! The vast majority of the work you see on this website has been done for free. My Medium article Domestic Workers Save Lives details the bigotry and misogyny that make it so difficult for me, and the caring people I collaborate with, to thrive. We work for free when we can, but we're often exhausted by all those "band-aid" gigs that we're taking on in order to survive! Help us find more time and energy to do meaningful work. Click the Donate button below to send the amount of your choice to our cause.